The training started in earnest at the GO33 in Glen Ogle last November, so it seemed fitting that that is where it should end. Unfortunately this year’s GO33 is just too close to the trip for me, so I decided to plan my last long run around part of the race route. I wanted it to be an easy, relaxed, fun day to complete the peak of my training. I put out a message on Facebook and a Runners World forum asking if anyone wanted to join me, and on the day I had 2 companions, a friend who made the pilgrimage all the way from Orkney and another from nearer to home; a small but perfect contingent and excellent company. 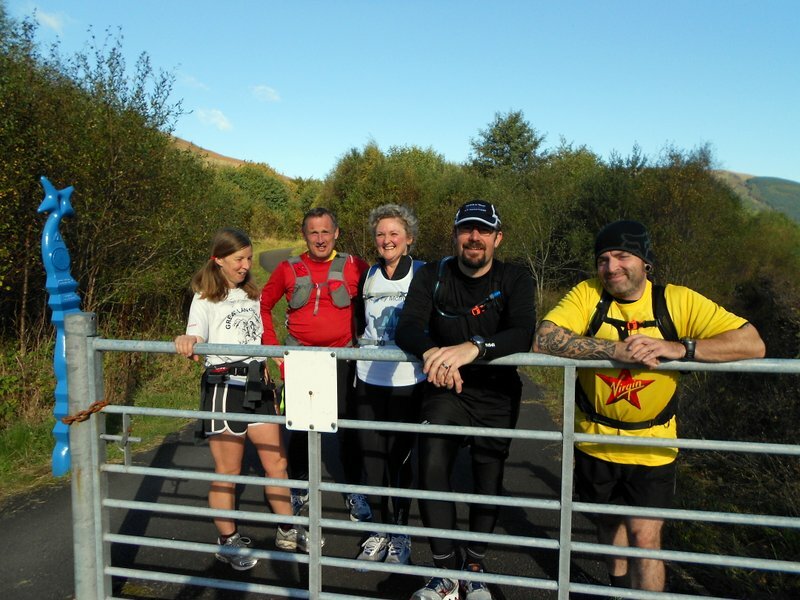 The planned route was to start from Kilmahog just out of Callander, then take the cycle track to Strathyre, the road round to Balquhidder, re-join the cycle track at Kingshouse, then on up to Loch Earn, over the viaduct at Glen Ogle to a turn point at the top of the glen. I had calculated that out to be roughly 36 miles. We were to discover on the day that that was not the case and the full route would have exceeded 40 miles. would it be like to run with something covering your face and having to breathe through it? It felt rather strange and alien at first. We set out at a slow bimble along the burn heading towards Loch Lubnaig. It was a beautiful autumn morning with sun sparkling on the burn, that lovely earthy autumnal smell and the amazing colours. sire like, but we were strong and stocked up from the bags in the boot of the car. I tried some chicken and noodle soup this time. It went down easily and had exactly the comforting effect that I had hoped; and even better it sat well in my stomach. photo op. We really weren’t taking this seriously, were we? We continued on our way and climbed up from Loch Earn (more photos) and into Glen Ogle heading for the viaduct. I was beginning to feel it now. It was only 2 weeks since I ran Loch Ness and the marathon was still in my legs. Elspeth was running well and strong and she pulled ahead of me and Alan; so much for her protestations that she might not manage the distance. She looked as if she had it in her. This section was longer than I remembered, and I had also forgotten that it is barely perceptible but long and steady incline. I was getting a bit tired and conversation was flagging. I had not been doing my usual run walk intervals and I had not been taking nutrition in every 30 minutes. This meant I was testing my endurance and my fat burning. Finally we saw Elspeth waiting for us, but no Alasdair. He had overshot the lay-by and was a bit further up the road and so I called him and asked him to come back down to us. We had a longish stop and all ate quite a bit. I think I can safely say I was not the only one feeling a little tired at 20 miles in. Elspeth ate a banana: brave I thought, knowing how devastating they are on my digestive system. The stop did us good and smiles returned to the faces and the chat and banter started again. We were quite high up and in the shade and soon began to chill so time to head back. We walked for a few minutes to allow our food to settle. When we started to run again Alan and Elspeth pulled away. They were nipping along at a fair pace. I looked at my garmin and I was doing just under 10 minute miles, so what on earth were they doing? And why were they leaving me behind? I could feel a bit of a petted lip coming on. Just before the end of the glen they noticed I was not with them and so slowed until I caught up. We had made good time back down, and continued back to Kingshouse with Elspeth pulling away once again. She was motoring: definitely powered by Duracell. Or was it the lure of the cup of tea she had promised herself? Back at Kingshouse we had a couple of decisions to make. What cake did we want and did we want tea or coffee. Oops no, sorry. Where did we want to finish? We were on 27 miles now, so to get all the way back to Kilmahog we would be over 40 miles and none of us thought that would be a good idea. I certainly had not set out to or intended to do 40 miles. We agreed to go on to Strathyre which would get us 32.5 miles: now, back to tea and cake question. Do we get a tea to take away and drink in the car park and as we set out? There was a bit of toe scuffing and mumbling. We were hungry and tired. What the hell, let’s just go for it, and have a stop, sit down have a cup of tea and a cake. After all this was supposed to a relaxed stress free run for all of us to enjoy, and it was such a lovely sunny afternoon. ourselves running again. We were refreshed and fueled and good for another 5.5 miles, the last wee hop back to Strathyre. As it turns out having a stop, eating and resting then getting going again was a good plan. I have been told that during the ultra in Antarctica runners tend to take breaks to rest, eat and warm up when passing through the base camp. Elspeth was off again. That meringue was like rocket fuel. Thinking about it, it is the perfect fuel: light and almost entirely sugar with a good dollop of fruit and cream thrown in. 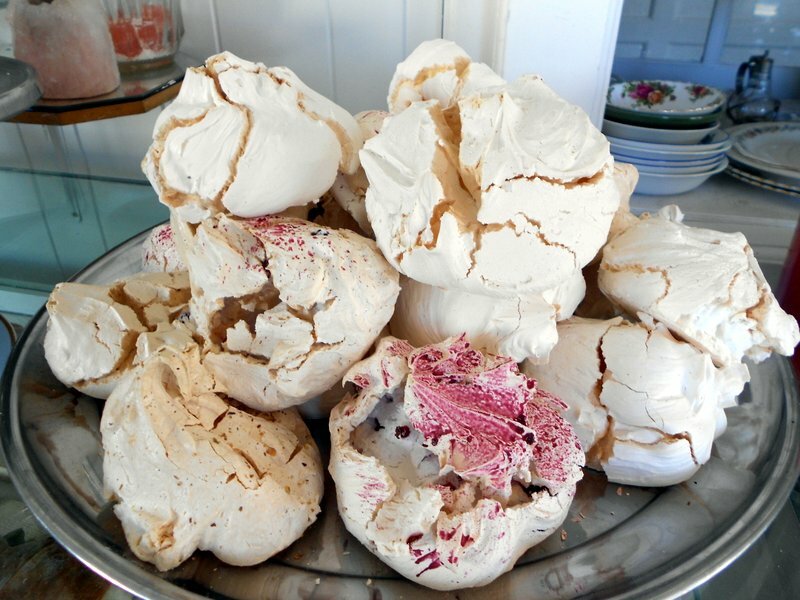 Note to self: try that next time, and I wonder if the Antarctic mess would stretch to meringues? We were slow, we took all day, we stopped and started, and we met friends and chatted. 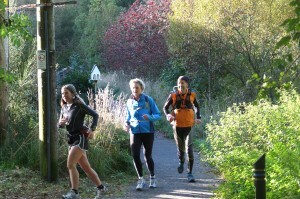 It was not the fastest training run but it was a happy and relaxed one with time spent in good company. Sometimes, that is exactly what you need. We drove back to Kilmahog and got to the Lade Inn before the Scottish Real Ale shop shut. A few bottles bought and then into the inn for some more food and a couple of pints of beer for me. Who says supporting runners is a thankless task? Coffee & cake x 2, a sneaky wee cup of tea from the van at the top of Glen Ogle, strolling and reading in the sun, real ale shop, pub supper seems Ok and Alasdair was a happy supporter. And who says this ultra running lark is no fun? We had a blast.